The cost of waste management is going up, and up is the only direction we can expect it to go in the foreseeable future. Meeting this challenge will mean optimizing efficiency and automating processes: a digital transformation. And success in this transformation to more digital business operations depends upon being able to deliver excellence in five distinct areas. Rising prices alone are reason enough for waste collection and recycling organizations—and that applies to cities and towns serving households and local businesses as well as private haulers providing specialized services—to look toward making the business of waste management more efficient. But rising costs are not the only challenge for the waste industry. The demands from customers for an excellent and seamless service are also increasing. Meeting these challenges head-on—to stay relevant and competitive in the industry—requires a substantial transformation of the waste management and recycling business, whether it is municipal services or private haulers we are talking about. Changes in how the business operates are never without challenges that are daunting for an organization. And the digital evolution of the customers themselves means that the question for organizations is no longer when to start the digital transformation. The answer to that is already an unequivocal ‘now!’ The only real question is where to start and what to accelerate. Digital transformation in the waste and recycling industries. Image courtesy of AMCS. That being said, digital transformation is still more of an evolution than a revolution, and a successful transformation is one that follows the step-by-step process of implementing the best solutions for where the business is at right now. The Digital Transformation Model1 is based on five of the most important operational drivers of the digital transformation process. 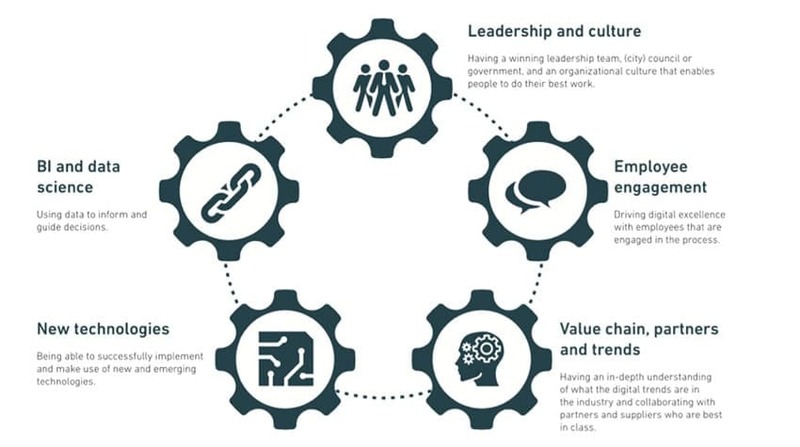 Delivering excellence in these five areas of the organization provides an excellent foundation for the success of any digital transformation. Research Participants were asked to rate their organization on a variety of statement that measure progress on the five elements of success in digital transformation. The average score on the 10-point scale was a mere 6.3. This barely-passing grade clearly indicates there is much room for improvement in the industry. The results of the survey show that leaders in the waste management industry clearly understand the importance of ‘soft’ factors., such as leadership and employee engagement, in making the transition. The digital part of the digital transformation is the real challenge: Unlike the softer aspects, like leadership, it is exactly the ‘harder’ technical aspetcs of transforming the organization, as in using Business Intelligence (BI) and data science or applying new technology, that forms the biggest challenge. When it comes to the application of emerging technologies, 60 percent of respondents gave themselves a falling grade. Average scores for business information were slightly better, but nearly half (45 percent) still gave themselves a grade of unsatisfactory. Legacy systems are the greatest barrier to successful digital transforamtion. For 54 percent of organization surveyed, it is the problem of legacy software and systems that creates the greatest barrier to full implementation of the digital transformation. 1. How do waste management organizations innovate and stay relevant? 2. What steps are waste management organizations taking toward digital transformation? 3. Which technologies are waste management organizations most interested in? To read the full report, visit https://us.amcsgroup.com/newsroom/news/press-release-the-digital-transformation-barometer. Mark Abbas is Chief Marketing Officer for the AMCS Group, and an IT executive with a track record of more than 20 years in the waste and recycling industry. As CEO of GMT Europe, a company that was acquired by AMCS in 2016, he led the company to international growth and successfully completed numerous acquisitions. Mark has been an evangelist in the waste and recycling market, working closely with product teams to keep IT solutions on the front line of innovation and designing new features and capabilities. For more information, visit https://us.amcsgroup.com.